Journalists from across the country lent support to staff at the Leicester Mercury as they covered a football helicopter tragedy on their patch. The Mercury and its sister website Leicestershire Live have won praise for their handling of Saturday night’s crash outside Leicester City FC’s King Power stadium, which claimed five lives – including that of the club’s chairman Vichai Srivaddhanaprabha. Mercury staff worked through the night, filed copy from holiday, came in from leave days and slept in the office in order to keep readers informed, while journalists from other titles across the country volunteered to offer support over the course of the weekend. As well as Mr Vichai, two members of his staff – Nursara Suknamai and Kaveporn Punpare – also perished, as well as pilots Eric Swaffer and Izabela Roza Lechowicz. Editor George Oliver told HTFP: “The most important thing today is to send the condolences of everyone at the Mercury to all those affected by Saturday’s tragedy. “Our staff were experiencing the same shock and grief as everyone else in the city over the weekend. They are supporters of Leicester City and the people of Leicestershire. Despite this, they remained focused on doing everything in their power to make sense of what was happening for our readers. “My colleagues worked through the night, filed from holiday, came in from leave days and slept in the office as we all tried to understand what had happened and reflect the mourning taking place in the city. “Further to this, we had several staff members from other titles around the country call in to offer their support. We accepted and were grateful for their assistance. 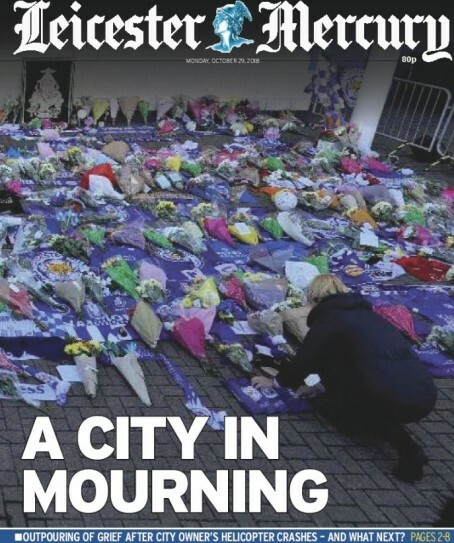 The tragedy occurred around an hour after City’s home match against West Ham United, which was the first game to be covered by Mercury reporter Jordan Blackwell in his new role as its Leicester City correspondent. Jordan’s move to his new role came after his predecessor James Sharpe recently left the Mercury to join the Mail on Sunday. George added: “I am proud of all the staff involved but in particular Jordan Blackwell, who was completing his first matchday as the Mercury’s new Leicester City correspondent. I’d have been impressed if they produced a Sunday paper, even if it was just 12 pages. Two sides to every story. Sorry to be a misery, but this hints how poorly staffed the paper might be. Frankly, this was a huge if tragic story dropped into the laps of the Mercury. Eight pages is decent, but not exceptional, though I do not doubt everyone worked very hard and did a good job. As professionals, that is what is expected from all journalists. Why offer support? If a newspaper’s management don’t employ enough staff then why reward it for getting rid of staff over the years? Also, the overworked staff should get unionised and protest their understaffing. This would be a perfect time! Out of interest, does anyone know if there was a reporter at the game? I know a few weeks back there was an interesting thread about not sending reporters to games as it was deemed superfluous because the copy could be obtained elsewhere. For me, this shows the value of having someone there because you can never know what the story will be. As for the how the news was broken, I first heard about it on Twitter and immediately went to the Leicestershire Live account to sort fact from fiction. There had been nothing posted in 5 hours – not even any mention of the game which had took place which seemed odd. I assume there is a specialist sports account but I can’t see why the main account had no mention of the game whatsoever. There was also nothing on the website probably 20-30 mins after the incident was declared by police. While I loathe people who aim to be first, rather than right, the online stories came quite a bit after Sky, BBC and other outlets who definitely were at the game. Sorry if this comes over critical – I actually think the Mercury is one of the better UK titles I have come across. But I thought, as a reader, the effects of cutbacks were noticeable but that isn’t the reporters’ fault.